We are here to help you create an environment where God can freely meet with you just like in the days of Adam. We believe that prayer is a powerful and effective way for us to communicate and connect with our Heavenly Father. We are aware that there are obstacles that might keep you from praying or find it sometimes difficult organizing or keeping a list of your prayers, and then eventually remembering to pray for those things when you have busy schedules. Eden Prayer App was created to solve these challenges, and to create a platform where you consistently communicate with God. 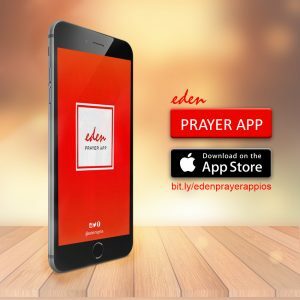 We are excited to announce to you that the Eden Prayer App is now available on IOS and Android. Daily updates of an uplifting verse, to guide you throughout your day. Alarm feature that helps you have a consistent and flexible prayer life. 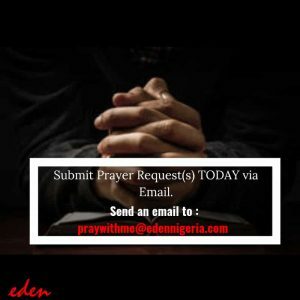 Submit your prayer request, and Pray for others. These and more distinctive features are available on the Prayer App. Download from IOS Store and Google Play Store today. 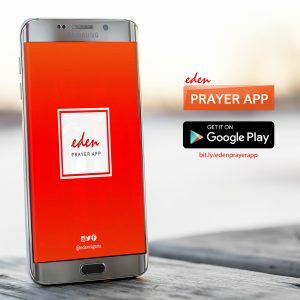 Eden Prayer App helps integrate prayer into your daily routine, allowing you to stay in an intimate conversation with God in the midst of your busy life. Prayer is one of the greatest privileges for the person of faith, and most of us wish we were better at it. Now when you say to someone “I’ll pray for you!” you can keep that promise and follow through with it. The Prayer App offers you a simple yet effective way to engage and enhance your prayer life. Now you can begin to have a consistent prayer life. 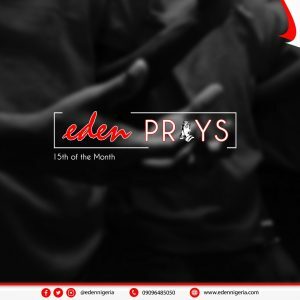 On the 15th of every month, Eden Nigeria conducts a prayer chain called Eden Prays where members of Eden and other interested people come together in faith to pray. We pray for ourselves, our nation, the world and Eden itself. This App is one of the ways of gathering prayer requests from people. We have seen God do wonders in the lives of those who submit requests and of those who pray. If you are available by 5 pm on the 15th of the month, you can join the rest of Eden people at any of our prayer locations or simply pray remotely in unison with several thousands of people.